Cantillana offers six high-performance systems that together offer solutions for all types of facades. 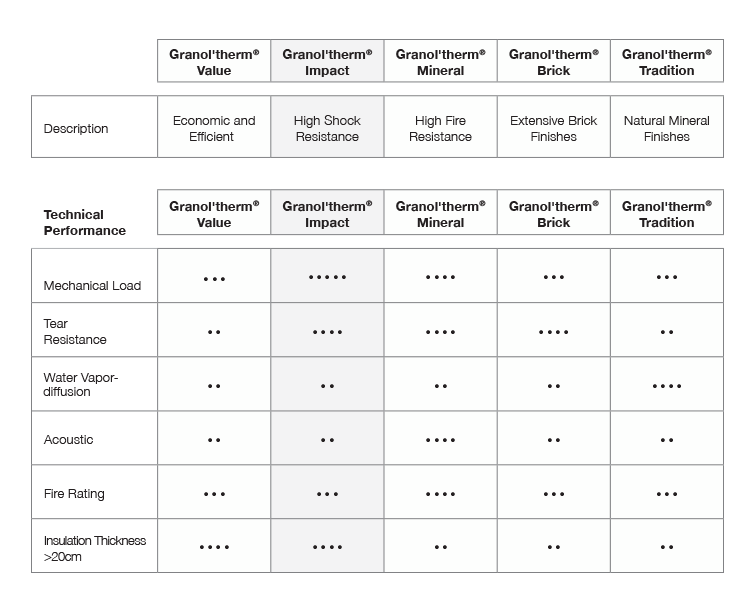 The Granol’therm® Insulation Systems are designed for both new construction and renovation projects. It is not only important to insulate with quality products but also critical to ensure high standards of installation are achieved. By wrapping the external façade in insulation, cold bridges that are difficult to solve with alternative insulation systems are easily insulated and thermal bridge eliminated. By insulating the facade on the outside, the walls retain their thermal inertia and the insulation works twofold: in the winter as a heat insulator to prevent valuable heat loss, and in the summer as thermal barrier to prevent overheating. This creates a very pleasant and stable indoor temperature, regardless of the season. 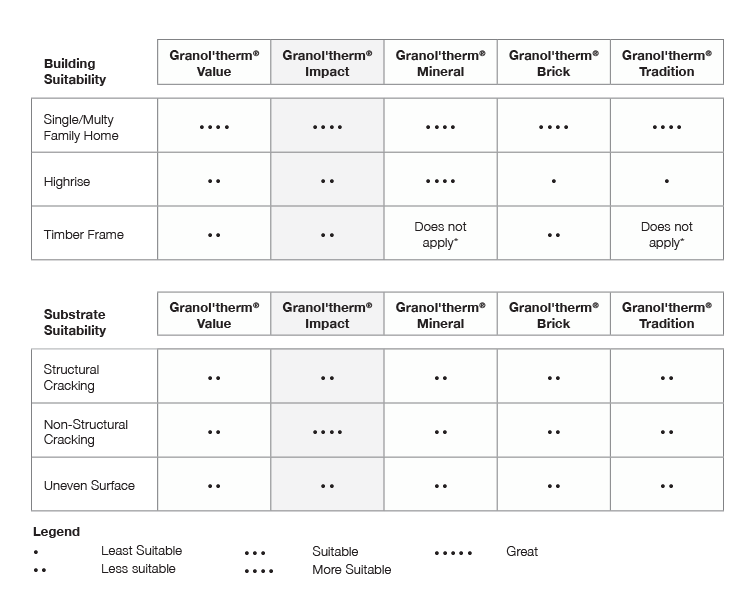 All Granol’therm® Insulation Systems are thoroughly tested for vapour openness. Thanks to this vapour-permeability, the moisture that is stored in the internal walls can be discharged without problems to the outside through evaporation. This reduces the risk of condensation and mould to a minimum. Besides the general insulating effect of wall insulation, it also protects the facade against big temperature changes and guarantees water tightness. The Granol’therm® insulation systems are available with a range of organic and mineral finishes that suit all styles. Organic finishes are available in a range of grain sizes, textures and are available in up to 150 standard colours. Mineral finishes are also available in a range of thin coat and thick coat finishes and textures and are available in up to 48 standard colours providing endless possibilities for enhancing the appearance of your building façade. Cantillana can also work with various third party render colour systems including RAL and NCS. Insulating the facade is done on the outside, so in turn minimises the disruption and inconvenience caused in the process.